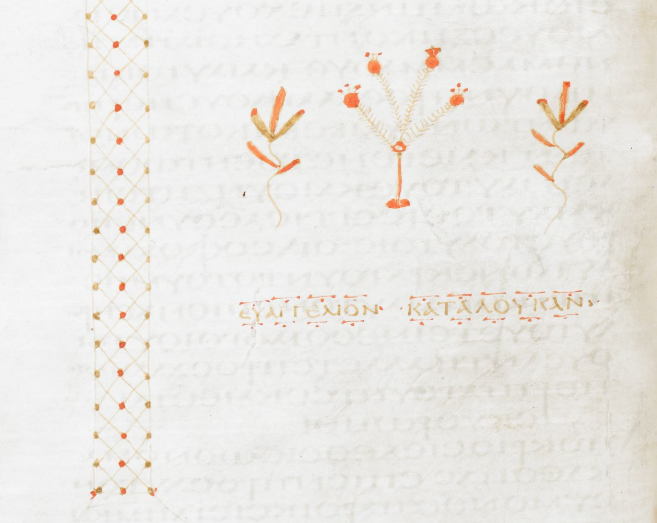 Image: This decorative title "euangelion kataloukan [The Gospel According to Luke]" appears at the end of the Third Gospel in Codex A or Codex Alexandrinus (f.41.v), a 5th century Greek majuscule manuscript that provides one of the earliest witnesses for the Byzantine text of the NT. Here are some notes on a textual issue in Luke 23:15 which I ran across when preparing to preach last Sunday on Luke 23:13-25. The question here concerns Pilate’s words to the chief priests, rulers, and people regarding his previously sending Jesus for an interview before Herod. The traditional text reads: “No, nor yet Herod: for I sent you to him [anapempsa gar humas pros auton]….” (KJV). The modern critical text, however, reads: “No, nor has Herod, for he sent Him back to us [anapempsen gar auton pros hemas]….” (NASB). So, did Pilate tell them that he had sent them (presumably along with Jesus as his accusers) to Herod, as in the traditional text? Or, did Pilate say that Herod had sent Jesus back to him (presumably after finding no fault worthy of condemnation in him), as in the modern critical text? The traditional text reading is supported by the following: A, D, N, W, Gamma, Delta, Psi, family 1, 565, 700, 1424, 2542, and the vast majority of Greek manuscripts. It is also found in the Old Latin and in the Haraklean Syriac versions. The modern critical text reading is supported by the following: p75, Sinaiticus, Vaticanus, K, L, T, Theta, 892, 1241. Among the versions it is found in some Vulgate mss and in the Coptic. “For they sent him to us”: 070, a marginal reading in the Syriac Harklean. In his Textual Commentary, Metzger begins his discussion of this verse by saying, “In the transmission of this clause copyists became hopelessly confused….” (p. 179). He describes the reading of the Textus Receptus as “utterly banal.” Though he describes the modern critical reading as the “best attested” and “most appropriate in the context,” he gives it only a “C” reading. Here is the question Metzger does not address: If the modern critical reading was original, how and why did the reading in the traditional text emerge? In fact, it is the reading of the traditional text that is the more difficult. If it originally read that Pilate said, “For I sent you to him….”, we can see how some readers might have been confused. The statement could be misread as if Pilate was saying he had sent the Jewish leaders to be tried by Herod. In the previous description of Jesus’ interview before Pilate, it says, “he sent him [Jesus] to Herod” (v. 7). However, Luke also indicates that the chief priests and scribes were there vehemently to accuse Jesus (v. 10). If the traditional text is original we can see how some scribes might have tried to correct any misunderstanding by changing the text to have Pilate say that Herod had sent Jesus back to him. If the modern critical reading is original it is harder to understand how the traditional reading would have appeared. With all due respect to Metzger, the preservers of the traditional text did not find this reading to be “utterly banal,” but, instead, they saw it as accurately reflecting Luke’s record of Pilate’s words. No matter how open that statement was to confusion, the tradition resisted efforts to correct, clarify, or smooth out the reading. The traditional text of Luke 23:15 has ancient and wide external support. It was the reading retained by the majority. In fact, it preserves a more difficult reading. The modern critical reading does indeed have early support, but perhaps this only indicates that there were efforts to smooth out a difficult reading early on in transmission. There is no compelling reason to abandon the traditional text.